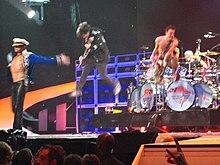 "Jump" is a song by American hard rock band Van Halen. It was released in December 1983 as the lead single from their album 1984. It is Van Halen's most successful single to date, reaching number 1 on the US Billboard Hot 100. The song differs from earlier Van Halen songs in that it is driven by a keyboard line (played on an Oberheim OB-Xa) although the song does contain a guitar solo, which was spliced together from multiple takes. David Lee Roth dedicated the song to martial artist Benny Urquidez, of whom he was a student. The synth line was written around 1981 by Eddie Van Halen but it was refused by the other members of the band. In 1983, producer Ted Templeman asked Roth to take a listen to the unused song idea. Riding around in the back of his 1951 Mercury, with band roadie Larry Hostler driving, Roth listened repeatedly to the song. To come up with a lyric for it, he remembered seeing a television news report the night before about a man who was threatening to commit suicide by jumping off a high building. Roth thought that one of the onlookers of such a scene would probably shout "go ahead and jump". Roth bounced this suggestion off Hostler who agreed it was good. Instead of being about a threatened suicide, the words were written as an invitation to love. Roth later told Musician magazine that Hostler was "probably the most responsible for how it came out." Ted Templeman recalls that "'Jump' was recorded at Eddie Van Halen's studio. "[Engineer] Donn [Landee] and Ed put the track down alone in the middle of the night. We recut it once in one take for sonic reasons. Dave wrote the lyrics that afternoon in the backseat of his Mercury convertible. We finished all vocals that afternoon and mixed it that evening." Live performances of "Jump" were preceded by Eddie's synthesizer solo "1984". During the reunion tour with Roth, the two songs were used for the band's encore. Roth often waved a large red flag during the synth section while the stage was still coated in dark cover lights. According to Daryl Hall of Hall & Oates, "[Eddie] Van Halen told me that he copied the synth part from 'Kiss on My List' and used it in ‘Jump.’ I don't have a problem with that at all." It is played before the start of each home game of Olympique de Marseille and Brøndby IF. As part of the goal celebrations it is also played every time A.C. Milan scores a goal at their home ground, San Siro. The original Winnipeg Jets of the National Hockey League played "Jump" on the arena PA system as the team came onto the ice. They used the song until the team's departure for Phoenix after the 1995–96 season. On the team's return in 2011, public outcry for use of the song initially was ignored, as the team's management company True North Sports and Entertainment wished to create a break with the past, considering the previous Jets a different organization from the new Jets (the former Atlanta Thrashers). However, in 2016 True North resumed the use of "Jump", this time as the team's goal song whenever the Jets score a goal at Bell MTS Place. "Jump" was the theme song for the introduction of Chicago Cubs broadcasts on WGN-TV in 1984 and 1985. "Jump" was ranked number 15 on VH1's 100 Greatest Songs of the 1980s. The song was listed by The Rock and Roll Hall of Fame and Museum as one of the "500 Songs that Shaped Rock and Roll." This song was covered by Aztec Camera in the B-side of their "All I Need Is Everything" single. ^ Jackson, Josh (February 1, 2012). "The 80 Best Albums of the 1980s". Paste. Retrieved March 7, 2019. ^ Cramer, Alfred William (2009). Musicians and Composers of the 20th Century. Salem Press. p. 1540. ISBN 9781587655173. In 1984 the song 'Jump' reached number one on the Billboard charts. The radio-friendly song combined hard rock with synthesizer-driven pop music. ^ Popoff, Martin (2014). The Big Book of Hair Metal. Voyageur Press. p. 58. ISBN 9781627883757. ^ Christe, Ian (2009). Everybody Wants Some: The Van Halen Saga. John Wiley & Sons. p. 97. ISBN 978-0-470-53618-6. ^ Crouse, Richard (2012). Who Wrote The Book Of Love?. Doubleday Canada. p. 144. ISBN 9780385674423. ^ "Classic Tracks: Hall & Oates "I Can't Go For That (No Can Do)" Archived 2006-08-30 at the Wayback Machine". mixonline.com, 2006. ^ "mvdbase.com - Van Halen - "Jump [version 1: concept]"". mvdbase.com. Retrieved 16 January 2017. ^ "The songs of soccer, from stadium anthems to Ronaldo's solo". DW.com. Retrieved 9 October 2018. ^ Minuk, David. 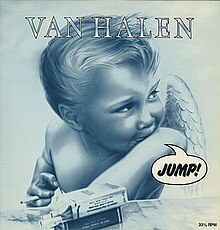 "Winnipeg Jets pick Jump by Van Halen as new goal song". Illegal Curve. Archived from the original on December 20, 2016. Retrieved December 5, 2016. ^ "500 Songs that Shaped Rock and Roll Archived 2007-05-02 at the Wayback Machine." The Rock and Roll Hall of Fame and Museum, 2007. ^ "Austriancharts.at – Van Halen – Jump" (in German). Ö3 Austria Top 40. ^ "Ultratop.be – Van Halen – Jump" (in Dutch). Ultratop 50. ^ Lesueur, InfoDisc, Daniel Lesueur, Dominic Durand,. "InfoDisc : Bilan des Ventes par Artiste". infodisc.fr. Retrieved 16 January 2017. ^ "Hit Parade Italia - Top Settimanali Single". hitparadeitalia.it. Retrieved 16 January 2017. ^ "Nederlandse Top 40 – Van Halen" (in Dutch). Dutch Top 40. ^ "Charts.nz – Van Halen – Jump". Top 40 Singles. ^ "Swedishcharts.com – Van Halen – Jump". Singles Top 100. ^ "Swisscharts.com – Van Halen – Jump". Swiss Singles Chart. ^ "UK Top 40 Chart Archive, British Singles & Album Charts". everyHit.com. 2000-03-16. Retrieved 2011-11-03. ^ a b "Van Halen Songs ••• Top Songs / Chart Singles Discography ••• Music VF, US & UK hits charts". musicvf.com. Retrieved 16 January 2017. ^ "Offiziellecharts.de – Van Halen – Jump". GfK Entertainment Charts. Retrieved 3 April 2019. ^ "Item Display - RPM - Library and Archives Canada". collectionscanada.gc.ca. Retrieved 16 January 2017. ^ "Hit Parade Italia - Top Annuali Single: 1984". hitparadeitalia.it. Retrieved 16 January 2017. ^ Currin, Brian. "South African Rock Lists Website - Hits 1984". rock.co.za. Retrieved 16 January 2017. ^ "The CASH BOX Year-End Charts: 1984". cashboxcountdowns. December 29, 1984. Archived from the original on July 11, 2012. ^ "Italian single certifications – Van Halen – Jump" (in Italian). Federazione Industria Musicale Italiana. Retrieved June 10, 2015. Select "2014" in the "Anno" drop-down menu. Select "Jump" in the "Filtra" field. Select "Singoli online" under "Sezione". ^ "British single certifications – Van Halen – Jump". British Phonographic Industry. Retrieved March 1, 2019. Select singles in the Format field. Select Gold in the Certification field. Type Jump in the "Search BPI Awards" field and then press Enter. ^ "American single certifications – Van Halen – Jump". Recording Industry Association of America. Retrieved February 13, 2016. If necessary, click Advanced, then click Format, then select Single, then click SEARCH. ^ "Aztec Camera | Artist". Official Charts. Retrieved 8 October 2013.